Fibrocystic breasts are characterized by discomfort and lumpiness in one or both breasts. 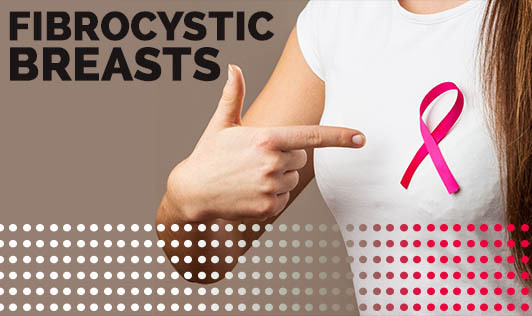 More than 60% of women experience fibrocystic breast changes at some point in their lives and the condition is benign and quite common, meaning that they are non-cancerous. This condition affects women between ages 20 and 50 and becomes less of an issue after menopause. The exact cause of fibrocystic breast changes is unknown but experts infer that reproductive hormones particularly estrogen play a role. Contact your doctor if you find a new breast lump or area of thickening that continues after your period or if a formerly evaluated breast lump seems to have grown or otherwise changed!